North Carolina-based gunsmith Nat Lambeth is one of the gurus of the Savage world. He has built many highly competitive match rifles using Savage actions, employing his special accurizing methods. 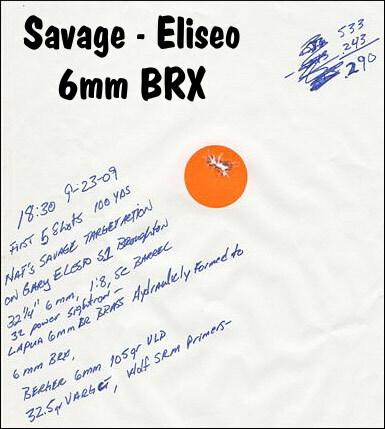 Nat recently built up a 6 BRX prone rifle using Gary Eliseo’s new S1 Savage Chassis. The 6 BRX, a 6BR improved with 30° shoulder, can be a very accurate cartridge, as demonstrated by Nat’s new rifle. Right out of the gate, this gun shot an 0.290 five-shot group during barrel break-in. The rifle features a Savage Target action, factory Accutrigger, and a very accurate 32.5″, 8-twist Broughton 5C™ barrel. The load was Lapua 6BR brass hydraulically formed to 6 BRX, 32.5 grains of Hodgdon Varget, Wolf (Russian) SRM primers, and a Berger 105gr VLD bullet. Nat really likes the 6 BRX chambering in a long-range prone rifle: “The 6mm BRX is like a 6mmBR on steroids. The whole purpose of the 6mm BRX and 6mm Dasher is to make the 6mmBR a better round for 600-1000 yard shooting. The have the advantages of the 6mmBR with a little more velocity. Most folks who shoot a 6mm BRX fire-form their 6mmBR brass by seating the bullets in the rifling and loading the 6mmBR case with a 90% load. The case expands into the larger chamber making a 6mmBR case now a 6mm BRX. [For this gun] I used my new Hornady Hydraulic Forming Die. [Editor: the hydraulic die will form the cases to about 95% of final shape using just the die, a water-filled case, and a mallet.] As you can see, the hydraulic die allowed me to start off with a standard 6mm BRX load from the get go. For optimum accuracy, barrel life, and case life the 6mm BRX seems to have an accuracy node between 3000 fps and 3080 fps. If you want to check out this rifle, head to the 2009 F-Class Nationals at Camp Butner, Sept. 30 – October 4. Nat explains: “This rifle will be at Butner for the F-Class Nationals and future matches and practices. I will have it and ammo available for those who would like to shoot it during the practice sessions both as a 6mm BRX and .308 Win.” For more info, call Nat Lambeth at (919) 556-0554 (Home/shop — evenings and weekends), (919) 662-6848 (cell), or email NLambeth [at] embarqmail.com. Share the post "Lambeth Builds a Tack-Driving Savage Prone Rifle"
Very nice rifle. I’d love to pull the trigger a few times at the nationals. With your obsession with precision, a tack driver is all I expect of you, Nat. Are they forsale and what would be the price for the BRX. Thanks Dan.